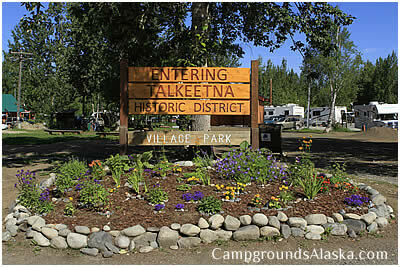 Guide to camping in Talkeetna Alaska covers the best places to camp in tents and in RV's when visiting Talkeetna AK. Directions - Located about 13½ miles out Talkeetna Spur Road in front of the Talkeetna Train Depot and just before reaching the Latitude 62 Lodge. 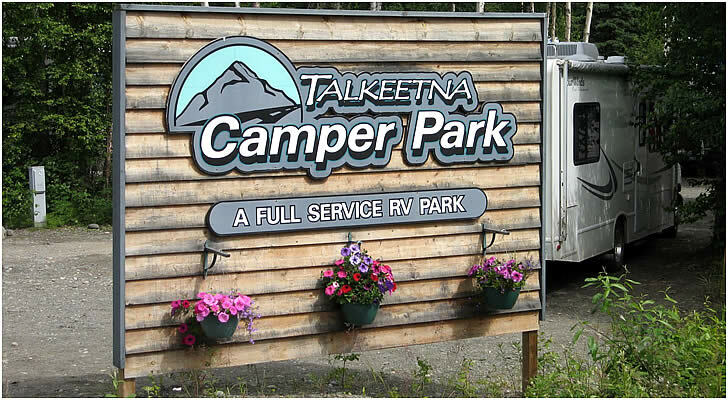 Watch for the Talkeetna Camper Park sign on the right hand side as you enter town. Dates of Operation - Main season, May 16th - September 15th. Shoulder season depends upon snow melt. Discounts during shoulder seasons are available; all sites just $20.00 nightly. Store - Some RV Supplies, Restaurants, shopping, views all within easy walking distance of the RV park. Tours - Lots and lots of excursions and tours to choose from.